December 11, 2014 5:00 am By Lori Post contains sponsored/affiliate links and I get commissions for purchases made from links. As an Amazon Associate I earn from qualifying purchases. Looking to build a stockpile? Is your coupon collection a little on the skimpy side? Well, you’ve come to the right place. All of these deals can be done with just a printer and a smart phone! You can head over HERE to read about this new format. July 25, 2014 10:06 am By Lori Post contains sponsored/affiliate links and I get commissions for purchases made from links. As an Amazon Associate I earn from qualifying purchases. Who wants a free pizza? 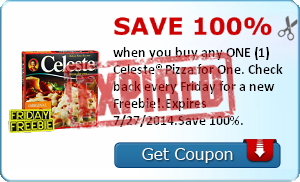 Head over to Savingstar and select the offer for a FREE Celeste single serve pizza, then shop between now and Sunday (7/27) to get in on this deal. And here’s a bit of good news. Savingstar now works at over 35,000 stores! Just scan your receipt using the Savingstar App to use at Walmart, Target, Walgreens Dollar General and thousands of other stores. Details HERE.